■ The preceding nominal cooling capacity is measured in the following conditions: the indoor dry/wet bulb reads 27°C/19°C, and the inlet/outlet water temperature is 30°C/35°C. ■ The preceding nominal heating capacity is measured in the following conditions: the indoor dry/wet bulb reads 20°C/15°C, and the inlet water temperature is 20°C. ■ The unit noise is a sound pressure level noise value measured through test in a semi-anechoic room according to relevant national. ■ The unit performance parameters are subject to change due to product improvements without prior notice. The parameters on the product nameplate prevail. ■ For details about on-site power distribution and wiring for unit installation, see the nameplate or installation manual of the unit. is applicable for various places such as commercial plaza, factory, hotel, and office building. EKWH180A(R)~EKWH350A(R) are horizontal/vertical and can be ceiling mounted or floor mounted. The air supply direction can be changed 90℃ . Compared with a split-type water source heat pump, packaged water source heat pump is easier to install. It runs as long as the circulating water pipe, air duct, and power supply are connected without installation of the refrigerant connection pipe and indoor/outdoor unit signal lines, greatly reducing unit hoisting workload. The use of building automation (BA) systems is more and more popular. The BA systems make remote device management possible, and can efficiently improve the device utilization rate, shorten the maintenance time, and save energy. EKWH series packaged water source heat pump provides intelligent RS485 interfaces for easy network connection. All units provide optional power off memory and self start upon power recovery. In a place with large story height, for example, a mall or factory, the large-scale integrated water source heat pump can be easily designed as a full air system to greatly reduce the number of air conditioning units and facilitate centralized management. The air conditioners can be installed in the equipment room or ceiling mounted. 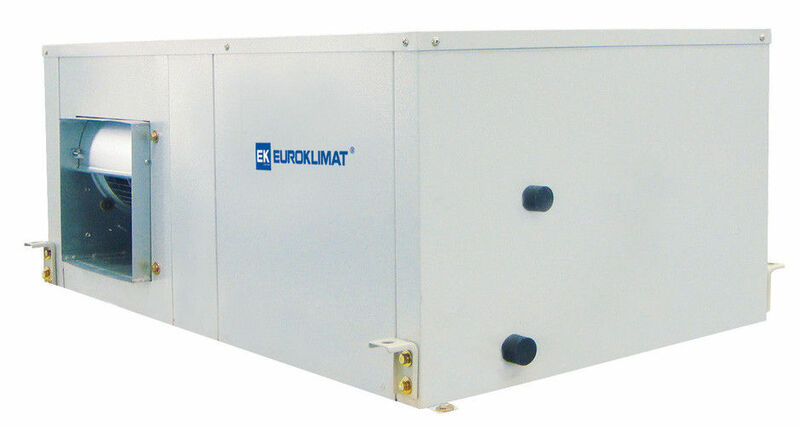 EKWH series water (ground) source packaged heat pump unit uses select world famous brand compressors and high-efficiency inner thread coaxial tube-in-shell heat exchangers. Through fine matching, the average cooling energy efficiency ratio can reach over 4.0. Certain units provide a cooling energy efficiency ratio of more than 4.5. For a large-capacity cooling unit with over 10 hp, parallel design for compressors is adopted for higher reliability and energy efficiency. EKWH series packaged water source heat pump is designed with multiple security protection functions. In addition to regular under-voltage, over-voltage, and overload protection, the following protection functions are provided: pressure protection of the cooling system, protection against water flow cutoff, and protection against over-temperature of the circulating water. In addition, the controller provides sound, light, and code alarms to report fault and protection information in a timely manner. Commercial plaza, factory, villa, hotel, and office building.